Urban Initiatives – PwC Takes the Field – TWICE! PwC Takes the Field – TWICE! Urban Initiatives is fortunate to count lots of amazing companies as Corporate Coaching partners for our fall season, but PwC takes the award for most volunteers and for coming out to play twice over the past twelve weeks. 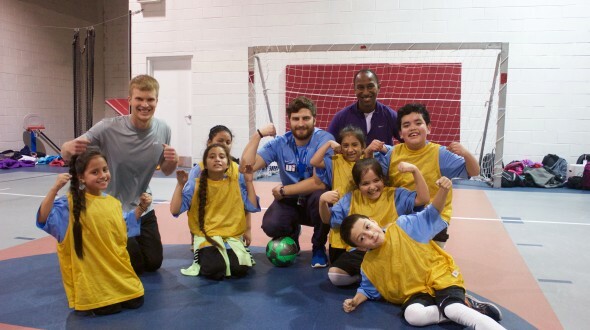 On October 23, nine volunteers met the teams from Gunsaulus Academy, Greene Elementary, and Walsh Elementary at Chicago Indoor Sports. A few weeks later, another eleven volunteers traveled to Logan Square for the final game day of the season with Urban Initiatives players from North River Elementary, Nixon Elementary, and Lawndale Academy. Both game days were marked by incredible support from PwC’s volunteers. The coaches connected quickly with their players, and they offered encouragement and cheers from the sidelines throughout the games. During stoppages, Urban Initiatives’ players took turns passing with the volunteers, and they even showed the volunteers how to use their sweet spots (the insides of their feet) for better accuracy. A huge thank you goes out to everyone at PwC who volunteered with us this fall. You helped make this season an amazing one!